Whoever said Christmas is all about fun never had to decorate a house, prepare a gigantic meal and buy presents for family and friends and teachers and the neighbour’s dog. While we’re stuck on dog present ideas, we do have a solution for getting your home to look the very merry part. 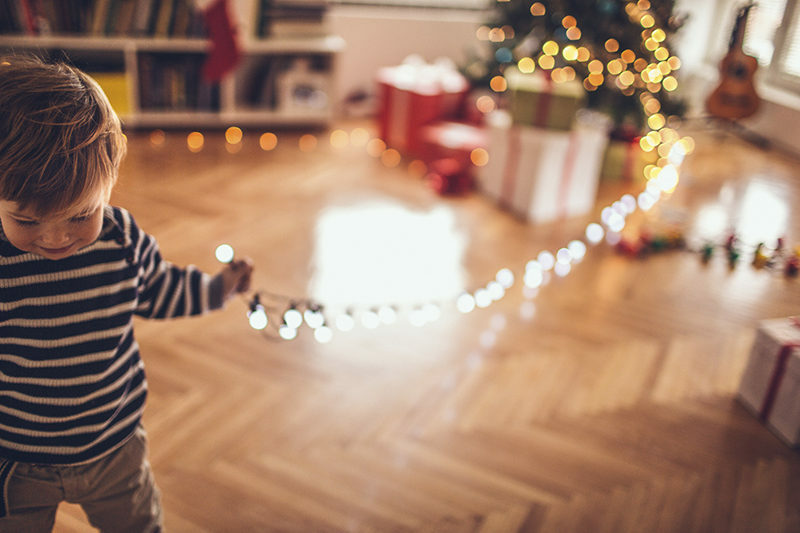 Pottery Barn Kids has all the festive kit for decking your halls, not to mention all the rooms in your home. That means now you just have to order the roast from the butcher, hire one of those gift-buying concierge services and put your feet up until Christmas day. Christmas legend has it that Santa leaves the best presents for kids with the most Christmassy bedding. Or at least that’s what you should tell your kids. You should also mention that he has a strong preference for a tidy room and neatly made up bed. We guarantee you’ll be enjoying the next couple of months with sparkling clean kids’ rooms. 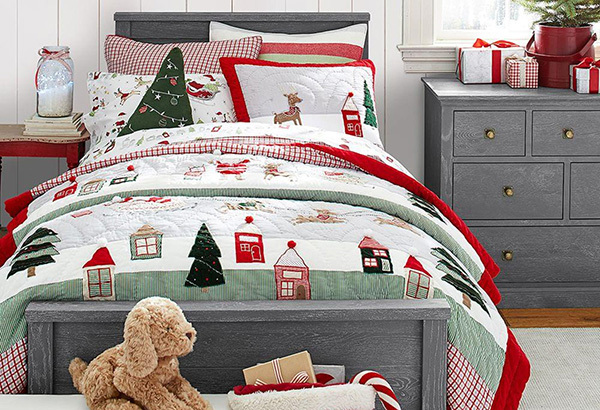 Pottery Barn Kids’ North Pole Quilted Bedding ($59-$249) has charming scenes of the North Pole as Santa gets ready for his epic one night journey. Red and green are undeniably festive, but sometimes a bit of subtle sparkle is all you need to dress up a home for Christmas. 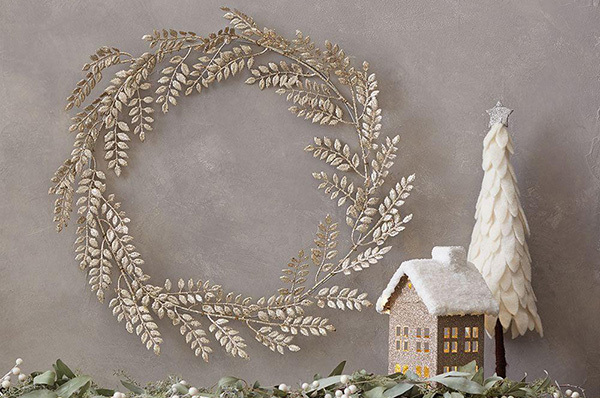 Pottery Barn Kids’ Glitter Wreath ($29) is made of silvery leaves gracefully curving in a circle. It’s a gorgeous minimalist touch, and would look lovely hung on a wall or to greet guests at the front door. It has yet to be verified by scientists, but anecdotally, we estimate that at least 50 per cent of children are obsessed with trains. Thomas the Tank Engine has a veritable train empire with thousands of loyal subjects. As far as we know Thomas doesn’t come in snow globe form, but you could probably do with a space in your home that’s devoid of that very reliable engine. 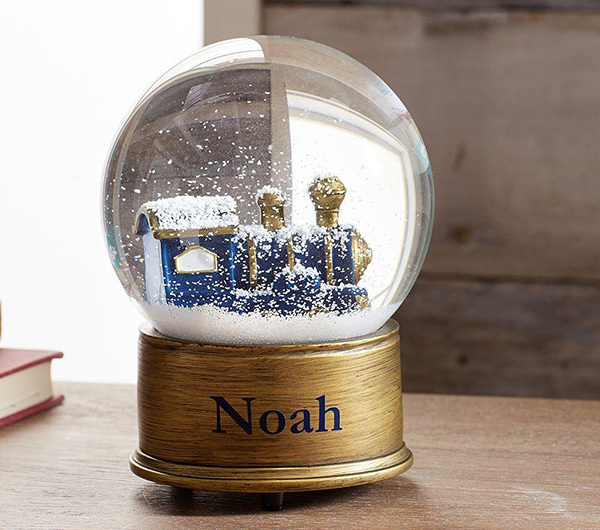 That’s where the Pottery Barn Kids Train Snowglobe ($69) comes in. It’s got a royal blue and gold hand painted engine stuck in a lovely snow flurry, and the whole thing sits on a wood base that you can have customised with your child’s name. Kids don’t need help getting amped up about Christmas, but advent calendars are an essential Christmas tradition. With its daily chocolate and count-down to the shiny new bike they’ve been begging for, the advent calendar is a lot of fun, and a great way to remind them that Santa is coming so they need to keep that room tidy. 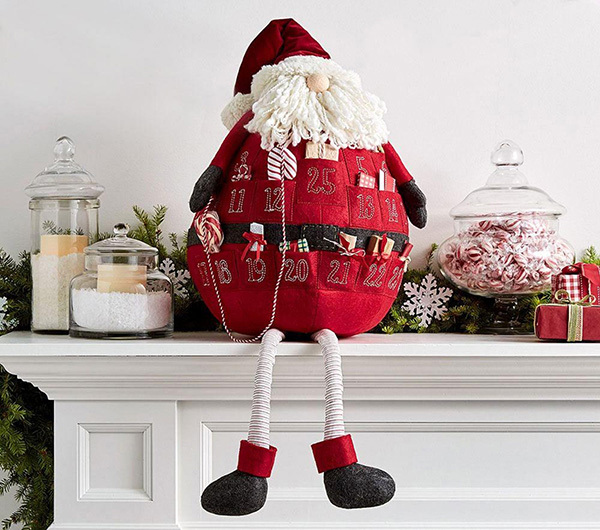 We’ve got some brilliant DIY advent calendar ideas, but if the idea of making one yourself sends you into a tailspin of anxiety, Pottery Barn Kids’ Santa Plush Advent Calendar ($90.30) is a lovely heirloom piece. This version of Santa has a charming, handmade appeal. He wears a velvet hat, and his beard is so full it covers everything but his button nose. His coat is a rich, warm red felt, stitched up with 25 pockets ready for a daily gift. If there are a few kids in your family, a row of advent Santas make a pretty decoration for the fireplace mantel. Shopping for Christmas stockings might seem easy, but actually it’s quite high pressure. A person’s stocking will make an appearance every Christmas for the rest of their life, so a classic choice is probably best. 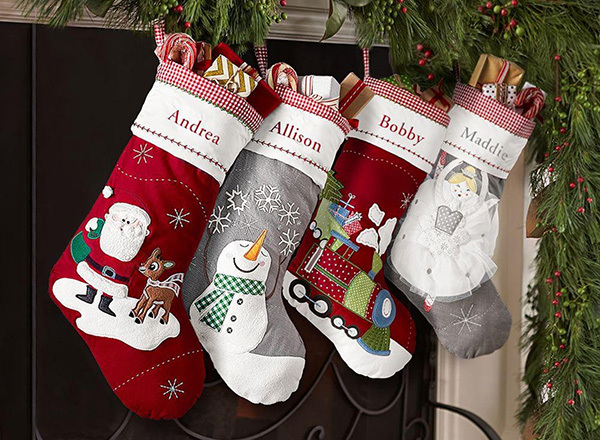 Pottery Barn Kids’ Quilted Stocking Collection $25.60 has snowmen, Christmas trains, Santa and snow fairies, and you can have them personalised in store with your child’s name. Christmas lunch is the perfect time to bring out your Nan’s china collection that you store away lovingly, (and protect fiercely) all year. 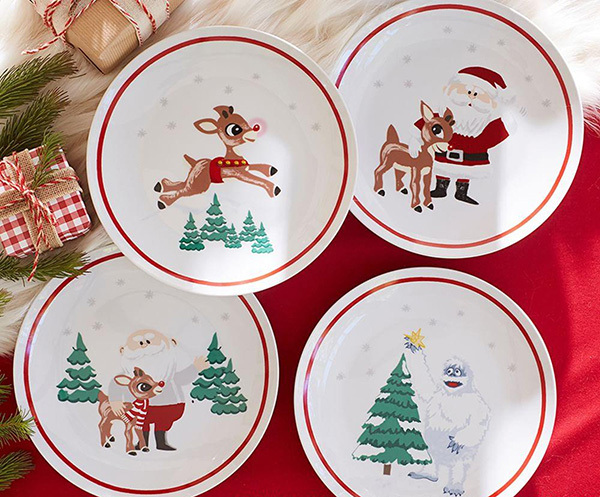 Your two-year-old probably can’t be trusted with gilded antique china, which is why there are Pottery Barn Kids Rudolph the Red-Nosed Reindeer Plates ($10). Decorated with characters from the classic 1964 stop motion animated version, the plates show Rudolph palling around with Santa, and Bumble the Yeti fixing a star on a tree. For more Christmas decor to kit out your home, check out Pottery Barn Kids.